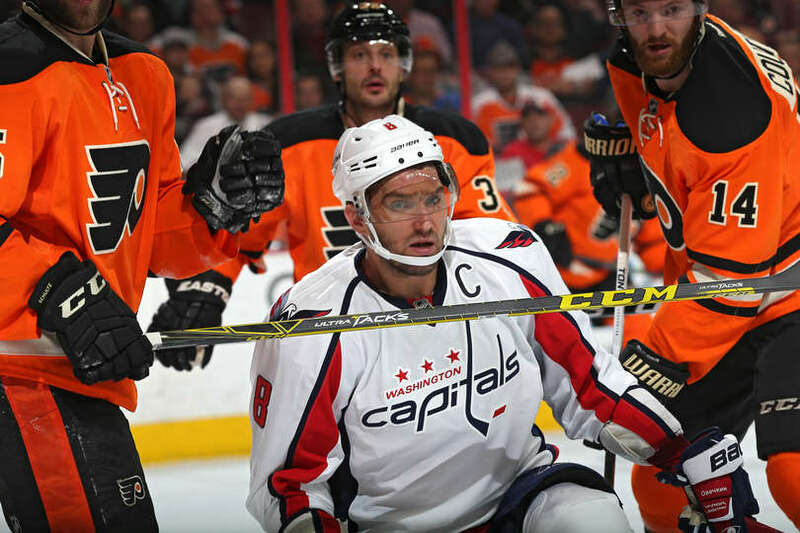 A third period essentially bookended by a power play goal from a star on both the Washington Capitals and Philadelphia Flyers was a fitting penultimate frame in a potential preview of the Stanley Cup Playoffs. Both teams had over 60 shot attempts and 30 hits each, and the atmosphere was befitting of this traditional Metropolitan Division rivalry. 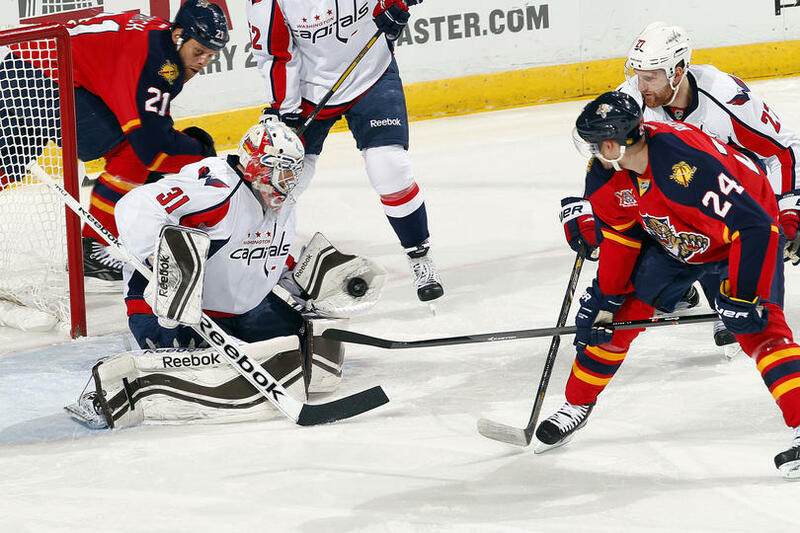 Following their Saturday night victory over the Tampa Bay Lightning, the Washington Capitals faced another former Southeast division rival on Tuesday. The Caps were greeted in Sunrise by a surging Florida Panthers team that has gone 5-3-2 over its last ten games. When the two squared off in mid-October, the Caps won a 2-1 shootout victory. Alex Ovechkin scored with seven seconds left to force overtime, but after a scoreless extra period, the Washington Capitals fell to the Detroit Red Wings in the shootout, 4-3. 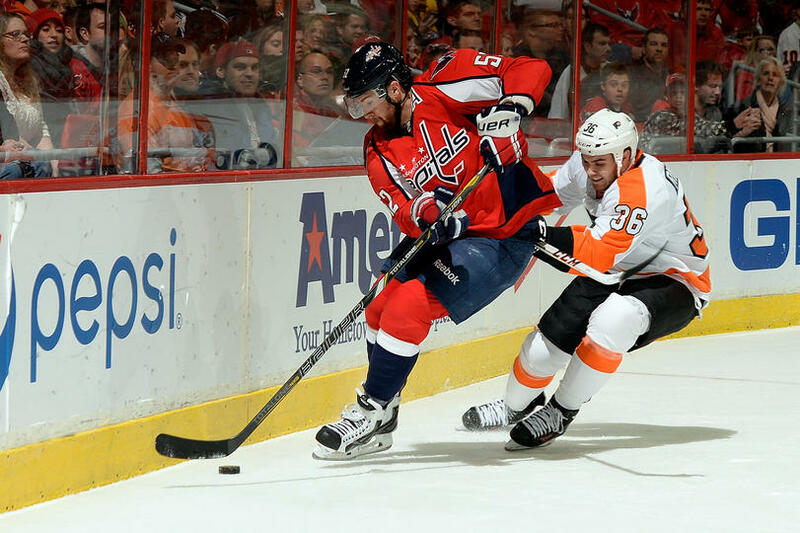 Ovechkin’s game-tying goal was his league-leading 39th of the season. Michael Neuvirth was the other star of the game for the Caps. The goalie was spectacular in spots, recording 42 saves on 45 shots. For the game, the Wings had 81 total shot attempts, the Caps 54. The Caps killed two penalties in the first period, getting down in shots 15-3. But late in the frame, Martin Erat drew a tripping call, and on the resulting power play, Nick Backstrom made a wizardly pass to Jason Chimera on the far post for the tap-in and a 1-0 lead. The Caps carried that narrow margin to the dressing room, despite being outshot 22-5 for the period. The Red Wings had 32 shot attempts, compared to just 12 for the Caps. At the start of the second period, Dmitry Orlov pinched in at the point while the Caps were in a line change, but a turnover sent Patrick Eaves the other way alone on Michal Neuvirth. Neuvirth came out between the circles to challenge the breakaway, and in the resultant scramble, Drew Miller banged home a bouncing puck. The Caps tied it at two midway in the third, with Casey Wellman getting three whacks at the same puck, finally beating Jimmy Howard. But with 10:15 left, John Erskine tripped over his own feet at the offensive blue line and turned the puck over to Gustav Nyqvist. The rookie forward carried in on a two-on-two, delayed, then snapped it past Neuvirth. But Alex Ovechkin still had a trick up his sleeve. After a late power play, where the Caps peppered Jimmy Howard but couldn’t beat him, the Caps lifted Neuvirth for the extra skater with about 50 seconds left. With seven ticks left, John Carlson fed Ovechkin at the left point, and Ovi blasted a slap shot that beat Howard stick side to knot the game at three. 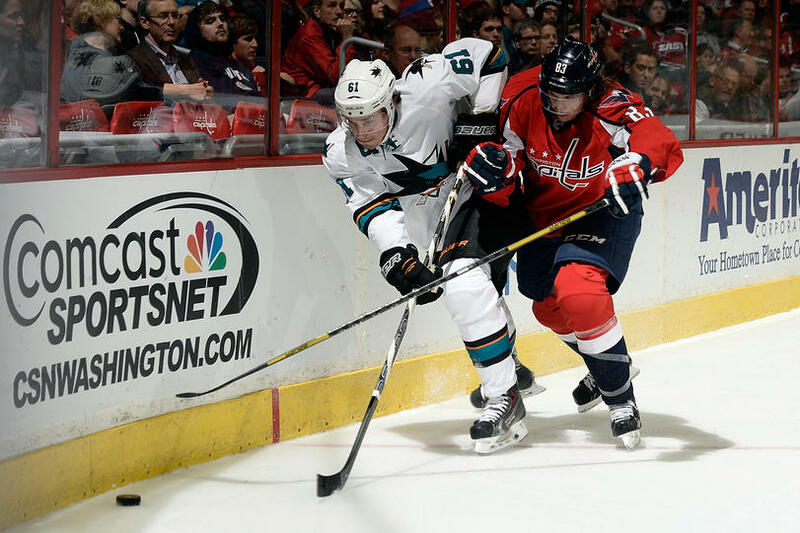 Almost two years ago, on February 13, 2012, when the Washington Capitals last met the San Jose Sharks, a young goaltender named Braden Holtby started in net for the Capitals. On Tuesday night, another young upstart goaltender, Philipp Grubauer­, started for Washington. He fared slightly better than Holtby in 2012, stopping 28 of 29 shots in a 2-1 shootout loss. This season, the Capitals have been lucky to win games solely on their goaltender’s merit on several occasions, and haven’t faced another truly “hot” goalie until their trip to Buffalo on Sunday night. 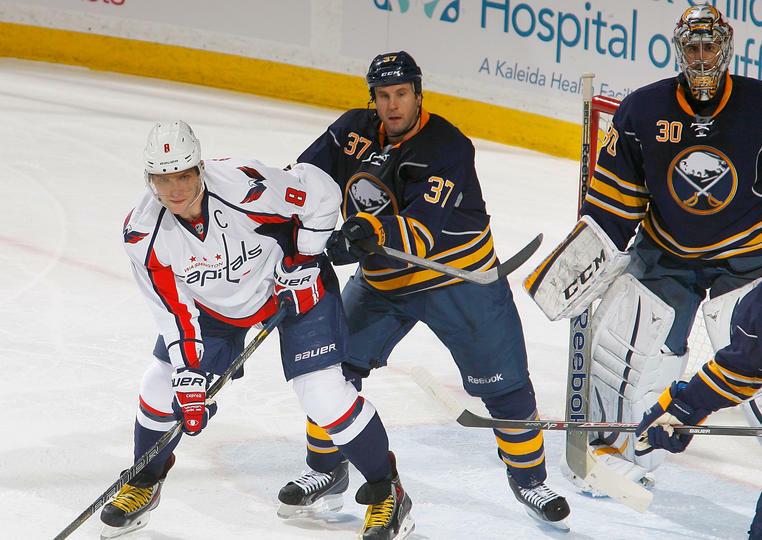 They peppered Ryan Miller with 50 shots on goal, but lost 2-1 in a shootout to the struggling Sabres, who only managed 17 shots on goal. It was the first time the Capitals have outshot an opponent in their last six games. Philipp Grubauer’s stint as the Washington Capitals backup goaltender has probably been a little more stressful than he bargained for. In his last three games, (one of them in relief of Braden Holtby) he’s faced some of the league’s best players in three straight shootouts. He stopped two Philadelphia Flyers shooters to top off the Capitals’ Sunday matinee comeback, a 5-4 shootout win. Mike Green, who had a rough night already with a waved-off goal in the first period, gave the puck away to Dylan Olsen early in the second period, who took the impetus to score and give his team a 1-0 lead. Outshot by 16-7 in the first period alone, it took a dirty hit on Eric Fehr by Erik Gudbranson late in the second period to help the Caps remember how to play hockey again. Sort of. They had 8 shots on goal in the second period, despite a 3-minute power play. Troy Brouwer came to his comrade’s rescue after the hit, earning himself 17 minutes worth of penalties in the process. Sure, he avenged his teammate’s honor, but robbed his team of a valuable piece of what would have been a 5-minute power play. Instead, it was two minutes of 4-on-4 hockey followed up by a 3-minute Capitals power play. All hail The Code. Fehr returned to the game in the third period after undergoing NHL concussion protocol. Okay, so a 4-minute power play isn’t something to complain about, especially when it’s a power play that’s as effective as the Caps.The wizardry of Mikhail Grabovski’s work on the boards during the 4-on-4 time paid off in the form of a Nicklas Backstrom wrist shot that tied the game. The Panthers Alexsander Barkov scored the go-ahead goal for Panthers before the 4-on-4 expired. Before the 3-minute Capitals power play expired, the Capitals scored the tying goal, but it was first waved off by the referee when there should have been a whistle. The play was reviewed, and the replay showed the goal belonged to Joel Ward, assisted by Marcus Johansson and Backstrom. Philipp Grubauer, the backup goalie’s backup, faced a total of 41 shots on goal, regulation and overtime combined, not to mention the 10 round shootout. The Capitals only mustered 25 shots the entire game, so this was a classic Washington Capitals case of goaltender bailout. By all intents and purposes, the Capitals should have lost this game in regulation, and by a much larger margin. Grubauer made save after magisterial save, and bailed out the rest of the team when they had a lapse. He plays with the composure and maturity of a much more experienced goaltender. However, there is no way the Capitals can continually allow their goaltenders to be shelled in every game and expect to win (or in this case, make it to overtime). It might work for a little while, but it won’t last forever. Just look at the Toronto Maple Leafs. Not all went as planned for the Washington Capitals during their home opener against the Calgary Flames Thursday night. After falling behind down 3-0 in the first period, and Jack Hillen leaving the game with a leg injury, it was clear the odds were not in the Capitals’ favor. But the Caps finally found their legs and rallied to earn a victory in a shootout, 5-4. Jack Hillen was injured on a clean hit from Calgary’s Lance Bouma in the first period, but it was unclear if the injury was to his knee or hip. He left the ice in visible pain, and it was announced that he would not return to the game, leaving the Caps to play with five defensemen for the remainder of the game. Tom Wilson avenged the hit by trading punches with Bouma, but it didn’t do much to rally the rest of the team. The Flames were already up 1-0, and scored again several minutes later. Postgame, Adam Oates told reporters Hillen had been taken to the hospital, but would only divulge that it was a lower-body injury. Tough luck for Hillen, who was sidelined much of last season with a shoulder injury. An Alex Ovechkin slashing penalty led to a4-on-4 situation where the Flames tallied again. Braden Holtby (three goals allowed on 11 shots) was pulled before the end of the first period and Michal Neuvirth stepped in, stopping 27 of 28 shots, stellar in relief. Holtby will start Saturday, per Adam Oates. Midway through the second period, a different team began to emerge. Connor Carrick, who had a pretty rough night early (on ice for two goals against), skated out of the penalty box to a clean breakway off a smart Marcus Johansson pass, scoring his first career NHL goal in the process, providing the jumpstart the Capitals needed to chip away at Calgary’s lead. Carrick is in good company. The last Capital to score their first career NHL goal on opening night was Alex Ovechkin on Oct. 5. 2005. If there was one thing that worked for the Capitals, it was the power play. The Capitals were 2-for-3 on the power play for the night. Ovechkin and Nick Backstrom both scored on the man advantage, and Backstrom’s tally tied the game in the late minutes of the third period. Three Capitals had multi-point nights: Ovechkin (2g, 1a), Backstrom (1g, 2a) and Johansson (3a). Neuvirth stopped both of Calgary’s shooters in the skills portion, and Grabovski and Ovechkin sunk their attempts for Washington giving the Capitals their first victory of the season. Postgame, Oates spoke about the mindset he instilled in the players after the first period that allowed them to come back from a three-goal deficit.